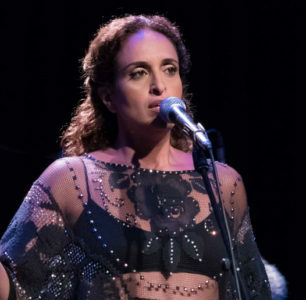 Israeli-born singer (1969), pianist and percussionist, of Yemenite descent. She grew up in Bronx, NY, but moved after high school to Israel. After the army, she attended the ‘Rimon’ School of Music, meeting Gil Dor who became her musical collaborator and accompanist. Her music reflects both her Yemenite heritage and the jazz and rock infused music of Gil Dor. Her career launched with him, completing several international and Israeli albums and hundreds of concerts. Noa has performed for presidents, popes and prime ministers as well as working with some of the outstanding musicians of popular culture in the United States, such as Stevie Wonder, Carlos Santana, Quincy Jones, and Sheryl Crow. Site contains a biography, discography, photos, news and political statements. Noa is especially known for her peace work and concerts promoting understanding between Israelis and Palestinians. She is married to Dr. Asher Barak, they have three children.